William Butler Yeats (1865-1939) was an Irish poet, dramatist and mystic. He was born in Dublin, Ireland on 13 June 1865. He spent most of his time in Sligo and some time in London. Yeats' early poetry drew heavily on myth and legend. His later work had more to do with contemporary issues. One of his famous poems is called "Leda and the Swan". With Lady Gregory and others, he was one of the people who founded the Irish Literary Theatre and the Abbey Theatre. He was also interested in Hermeticism and Theosophy. He was a member of the Hermetic Order of the Golden Dawn. 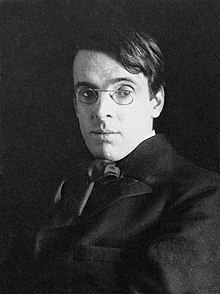 Yeats won the Nobel Prize in literature in 1923. He died in Menton, France. This page was last changed on 31 January 2018, at 08:20.